Jack Butala: Welcome to our show today. 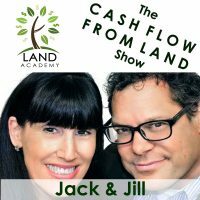 In this episode, Jill and I talk about landpin and how it’s open for business. Been a long time, Jill, and a lot of work. Jack Butala: But it came out great. Jack Butala: Before we get in to it, let’s take a question posted by one of our members on the landinvestors.com online community. It’s free. Jack Butala: So, I look at … I gauge all of this by, with money. It’s not really about the property, or just moving stuff around. And I call it cash in, cash out. So, when you write the check, or however you purchase a property, that’s cash out. And when do you get your cash back, times whatever. Hopefully a positive multiple. For us, it’s times two. And I look back on all the properties we’ve ever sold, and even recently this is true, it’s about 30 days. So, you know, to directly answer your question. That’s reasonable goal. If you’ve done everything right in our program, if you purchased it for 20, 30, 40% of what you really think it’s worth, and you’re trying to double your money, then that’s really what should happen. Here’s a few things that I think could get in the way of that. You purchased a property in an area where there’s just tons, and tons, and tons, of properties for sale. I’ll reel off, just for fun, in the lower priced asset business we’re all in, I’ll reel off a few subdivisions that I would avoid: Deming, New Mexico is packed with half acre properties that everybody seems to own one, on the planet; there’s a few subdivisions in southern Arizona that I would avoid now, because there’s just so, there’s 10s of thousands of properties in these subdivisions. But, in general, if you stick with acreage, like most of our members do, you’re going to do great. Everybody loves acreage. And now, I think yesterday, we talked about somebody with an infill lot goal. Those are great. You know, you should cash in and cash out of those. Jill DeWit: It’s always nervous … You’re always nervous your first few properties. And I understand that. And it’s funny, because, don’t, don’t lower your prices. As long as you priced it right, I mean, as long … I mean, Patrick and Jessica, have the inside track, so you know how to buy it right? You know the ball park. You know how to price it to sell. And you know that you’re under … If you did it like we really, really tell you, and suggest, which is, it’s already priced way below anything else out there, you just need to get it out there now. That’s the next thing, is just market the heck out of the thing. And the people will come to you. It’s so … I can’t tell you how many times, that we’ve had this conversation with people, and they … And it finally sells, like the next day it sells, and then two days later they get a call from a guy who would have paid more. Jill DeWit: So, we’re like, don’t go knocking your price off yet, you just barely begun to let everybody know. Jill DeWit: That’s the thing. Jack Butala: And then, the other thing is that, and this is my final point, Jill’s probably got 6 or 17 more points, my final point is, go out, and if you want to sell it bad, and everybody does, don’t just sit around and wait. We talked about this yesterday, too. Jack Butala: Go out there and find the buyer. Jack Butala: Go into Facebook, and wherever the property’s located, forget about the fact that it’s real estate, just start talking about it. “We have this super crazy property.” You’re going to find that. In our little world here, as Jill says, we’re very comfortable. 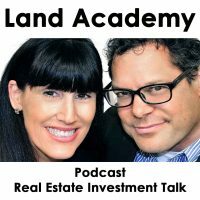 We’re comfortable talking about property that’s priced at $100 an acre, $300 an acre. The rest of the planet falls over about the first time they hear that. Jack Butala: And I mean the rest of the planet, literally. If you talk to somebody anywhere out of this country, and you say, “Yeah, we just bought a 40 acre property for $5,000. And we’re going to sell it for $10,000.” They just look at you in amazement. Well, they don’t believe you, first. Jack Butala: So, it’s all about getting the word out. Not only about the property that you have here, but about the fact that you can actually buy a rural piece of real estate for $10,000 and live happily ever after. Jack Butala: You can tell that story. Jack Butala: Go onto landpin and see the story. Some of our successful members, you’ll see them on there. In fact, that’s what this is about, landpin. Jill DeWit: Yeah, but … yeah, go ahead, sorry. Jill DeWit: I was just going to say that, yeah, that’s the thing. Landpin.com is a great place … When you see the property on landpin, and you see how well it’s priced, you need to know that they bought it for a lot less than that. Jill DeWit: So, there you go. Jack Butala: How the heck are you buying this so cheap? Jack Butala: Let me in on it. Jill DeWit: … at a great price. Exactly. How are you buying it even less than, you know, what I paid? Hold on a moment. Jack Butala: So, this thing from our regular land buyers went on. This line of questioning went on for, what, 15 years? Jack Butala: So, we finally just decided to shut them up, and do something about it. So, that’s why we started this crazy thing called landacademy, now landinvestors, now offersacademy, now whatever it’s going to be from here. Jack Butala: We don’t even what it is. Jack Butala: In our executive office, were we train people, in California, we have … Jill put up a board. It’s a white board, but, think of like wallpaper, but it’s not. You know, it’s like a big roll of wallpaper, and we keep buying more wallpaper. Jill DeWit: Just wrap it around the room. Jack Butala: … the office. Like we buy a bunch of dot-coms. Jack Butala: Our members ask us for tools to make it easier for them to buy and sell property, and so we just keep giving them to them. Jill DeWit: Who else does that? Can you imagine? Let’s just … I’m trying to think of any other industry that you could say, “You know what? I’m really having trouble with this, this doesn’t work for me. Can you help me with a product that would solve this?” What other industry would do that? Jack Butala: Oh, and can you include it? Don’t even charge me for it. Jack Butala: Can you include it in my monthly fee? Jack Butala: I don’t want to pay anymore. I just need more stuff. Jill DeWit: Hey, Cox, can you add, or however your cable provide is, or something, can you add these features. And I don’t want to pay for it, by the way. Jack Butala: Hey, Cox Communications, I have cable TV, I want to remove 80% of the channels I don’t watch. I only want the ones that I do watch. Jack Butala: And I want you to lower my price. Jill DeWit: Right. That’s it. Could you imagine? How great would that be? I only want the sports package, but I’m going to pick the sports that I want. And I want them for a dollar. Jack Butala: Hey, utility company. Hey, utility company, I want all the electricity that you provide, and I want you to provide light bulbs. Jack Butala: I want you to come over here, and screw them in for me. Jill DeWit: Right. And these taxes, they’re just too much. What can you do about that for me? Jack Butala: There’s marriage like that. Jill DeWit: Oh, I was waiting for that. Jack Butala: So, you get more benefit with less of the hassle. Jack Butala: I’m not even going to tell you what the male version of that is. Jill DeWit: … bring me a glass of wine in the evenings. And, let’s see, and it’s all for the same price, by the way, because I’m not changing a thing. This is what you get. Jack Butala: So, kid number three, all kidding aside, I’m going to leave this rated G show where it is right now. Our kid number three, just changed school systems, and you look at the test scores of this new one, it’s leaps and bounds better than the other one. Jack Butala: The former one … And I said, “It’s not often that you can get, you know, a Cadillac for the price of a Chevy.” And he looked at me cross-eyed. And I said, “A Lexus for the price of a Toyota.” And then he understood what I meant. Jack Butala: But it’s true. We keep adding stuff to our existing … Landpin is an example. Landpin.com is free if you’re a member of landinvestors. If you’re not, it’s half the price. If you want to post property and you’re not part of the group, because you’re Mr. Know-it-all, and that’s fine, you can post property on landpin, you know, and it’s half the price of the Land Watch, and Land and Farm. Intentionally, it’s literally half the price. Jill DeWit: That’s kind of how we roll. I kind of like that. Some of our other products we’re looking at it that way. Jack Butala: Did you ever notice that? Jack Butala: All our stuff’s half the price. Jill DeWit: Gee, like our property: better and half. Jack Butala: And we double our money. Jack Butala: Everything’s half and double. Jill DeWit: … that’s our theme. You’re better at half. Jack Butala: Join us in another episode … What does that mean? Jack Butala: Join us in another … Like the bottom half, or the hot top half? Jill DeWit: We’ll leave it rated G.
Jack Butala: Yeah. I’m digging your top half lately. Jill DeWit: Okay, that last comment was not G. It was G.
Jack Butala: But there’s a lot of places we could have taken that. Jill DeWit: That’s true. Good thing we shut that down real quick. Jack Butala: What else would a husband do, jill, that would work for you? Like a feet rub? You know these are good things for me to know, and there’s a lot of guys that are lost out there in this stuff. Jill DeWit: You know what, you already do them. You’re agreeable on stuff. If I throw out suggestions, about dinner and things, you’re not … You’re easy going. They need to be … Are most men easy going? Jack Butala: I think so. I don’t know. Most men don’t know what they’re doing. They just stumble around and wait for somebody to say you’re doing good, or you’re, stop it. Jill DeWit: Got it. I hate to tell you this, but we know that.